It is the most beautiful goat breed of India, in Uttar Pradesh, the name of this breed has been named Jumunapari (Jamnankari) in the name of river Yamuna in the state of Uttar Pradesh. This goat breed has been imported in Indonesia. And that's also quite popular. Along with India, this breed is also found in Bangladesh, which is famous for goat milk and meat. This goat is also famous in India by the name of Dairy Goat. 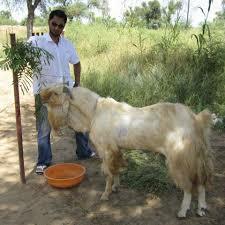 The following are the characteristics of Jamunapari goat breeds found in India. This goat is large in size and the male is quite big than the female. When it comes to coat colors, these goats are in white, black, yellow, brown or various mixed colors. Jamunapari Goat Produce more milk hence the this breed aslo called Dairy Goat. The typical character of Jamunapari goat breed is a highly convex nose line with a tuft of hair known as ‘Roman Nose’ or parrot mouth appearance. Generally, the ears of this breed are very long, flat and drooping. Both male Jamunapari and female Jamunapari goats are horned with short and thin tail. Generally, the goat's body develops with long legs, pendant ears and small and thin tail. This breed has long hair in the thighs and back legs. The milk of Jamunaapari goat is very tasty and healthy, which contains about 5 to 6% fat. Jamunaapari goat breeds are small horn horns which are rotated backwards. Jamnapari goats give birth to one child in a year. Jamunaarpari goats like grazing in open spaces.